To celebrate Tupperware's 45th anniversary, Working Mom is inviting 45 women to an exclusive Tupperware party with stacks of prizes and freebies to be given away! To be one of the lucky 45 women, all you have to do is join their promo. 1. Write one good story of how Tupperware makes things easier. Send in your name, complete home address, mobile number and occupation. 2. 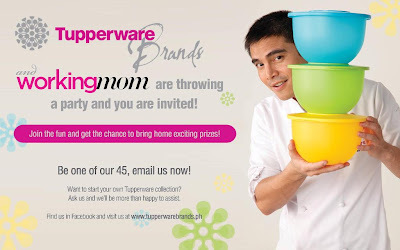 Send your entry to workingmompromos@gmail.com with the subject, Tupperware promo. 3. Plus, indicate if you have a Tupperware dealer serving you at the moment or have lost contact with her. Deadline of entries is on October 7, 2011. The 45 women will be informed via email from a Working Mom representative. So send your entries now! The party will be on October 22, 2011. Yay! I wanna go! Hope they pick me too. Hihi. email sent already! hope to be included in their list.